When I lived in San Diego, my bike was my primary mode of transportation. I got into a few scrapes with opening car doors, ran down an old lady (I'm not kidding and I am very, very sorry for it) and got a ticket (still not kidding). But my most memorable and scary experience was when, as I was flying down a very busy 4 lane street that is a very steep hill, an exhibitionist opened his car door out into my lane and stepped out of his car to face me. He was stark naked. Again, not kidding. I was furious with him because losing control on that street and hill would have been disastrous. I yelled at him all the way down the hill. Love the movement in your drawing! Yes, lovely movement and balance. Thanks! Let's hope the balance stays until the end of the semester! What a marvelous image! I'm a teacher too (English, though I wish I were teaching art), and my room is completely buried in papers. I really need to dig out. But your lovely image gives me hope! Lol! Wonderful post and I love the energy and line quality! You know, I haven't met a woman yet, who hasn't had a "flasher" experience! I had the guy naked in a raincoat experience in NY! For some reason, I laughed uncontrollably, the guy turned red and hurried away quickly. I guess that wasn't the response he wanted! LOL! The semester coming to an end, hang in there, one paper after another, remember, this too, soon shall pass and then hopefully some fun can begin! :) Sending you hugs through it all! Thanks, Indigene and Corsopsis. There's light at the end of the tunnel; only six assignments to go. Indigene, your comment about the flasher reminds me of a Japanese fairy tale in which three women flash an oni, (ogre) figure and foil him because he laughs so hard that they can get away. Kind of turned around, though. this is wonderful, I love the movement you have created in this and the wings, love the wings. oooh, i can feel the energy here! I love the wings and thought of flying into the waves here. So nice to meet you through SS! 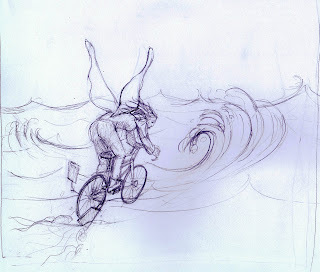 Interesting sketch...I can feel the speed...and story! Eek. No thank you! 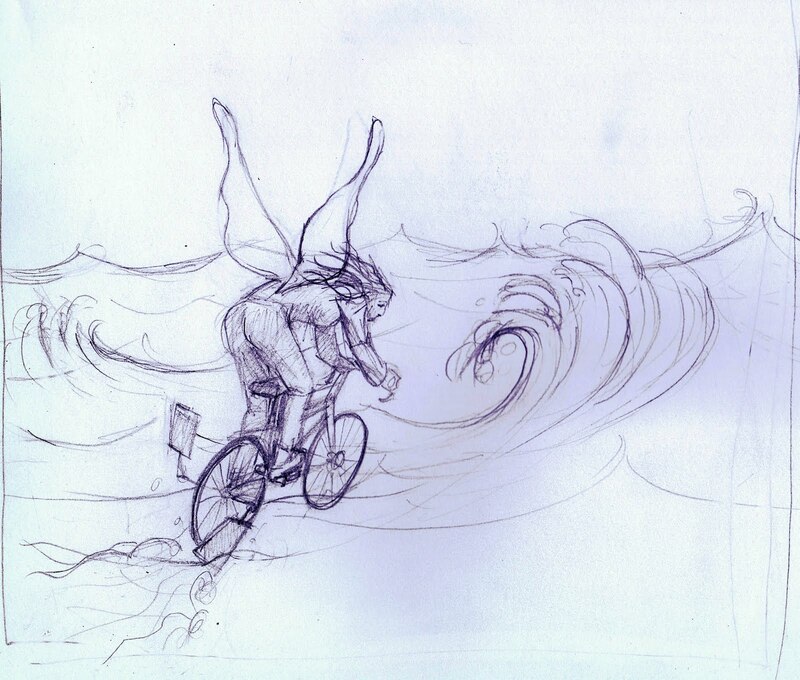 This is a wonderful sketch, It shows movement and emotion. your title adds so much to your lovely sketch! Great bike stories too. Thanks, Sophia. Wonderful of you to start Sunday Sketches. See you soon!